We were walking across the panchayat area from one school to the other and were observing a number of things around the panchayat area. While walking we saw a bunch of children playing with bows and arrows. We asked them, where did they buy it? They replied that they made it by themselves. When we inquired more, a few children among them knew to make even more toys from wood. Not all children had this skill though. Most of the people living in Bagdunda are from Bhil tribe. Bhils are known for their archery skills. Archery and dramatics are part of their culture. Their role in the 1st war of Haldighati has been well acknowledged. Lalit is from the community of Bhil tribe in the area. He demonstrated his skill by making a bow & arrow in front of us by cutting a piece of wood. He showed us a number of other toys which he made such as – bullock cart toy, cricket bat and sword. He said, his grandfather taught him this skill. 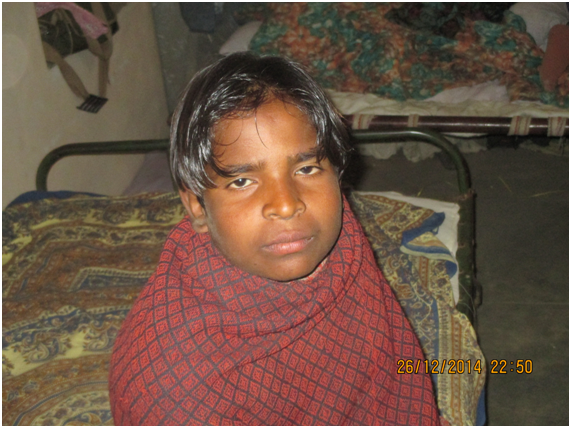 When we inquired further, we came to know that Lalit do not go to school regularly. Rather, he hates studies and the school. He says,” I simply don’t get what they teach in the school”. Lalit’s father is a migrant labor who is working at a construction site in Surat. Her mother takes care of the cultivation on the little land his father owns. Lalit helps her mother in farming. Both of his parents never went to school. They live in a BPL house provided by the government through ‘Chief Minister’s Housing Scheme’. Her mother wants him to study hard and lead a life of dignity but he never gets any interest in studies. Lalit’s case is an example of how a child learns from the community he/she lives in. He learns from the environment. They don’t get fancy toys around this area. Therefore, they started making their own toys. The formal education system doesn’t have space for such traditional knowledge. Formal education system don’t even acknowledge this as a knowledge because the definition of knowledge is very narrow. When we asked more people about Lalit’s skill of making toys out of wood, we came to know that it was very common in the past. It was now that people has stopped giving it any value at all. It was for a genuine reason- “What is the use of this knowledge? What this child will earn out of it in the future?” they said. It is a valid question indeed. But let’s give a thought to the reason behind this question itself. Our society progresses in a particular societal structure where every skill and knowledge is appreciated by putting a value to it. This value, in general, is a monetary value. In such a scenario, a skill or a particular knowledge may not get acknowledgement for its novelty or aesthetic value. Unfortunately, formal education system also progresses in a structure where traditional knowledge has been valued at a lower level. The knowledge of that we have got from the era of enlightenment in the west has been valued at a higher level. In this structure, any new addition to the knowledge is appreciated. But such kind of addition is within a given framework. The destruction of some existing knowledge is not even acknowledged. As we were expecting, Lalit’s school teachers do not know anything about this skill. They rather replied back with the same set of questions that we rose earlier. They didn’t appreciate the skill of Lalit. While writing this child’s biography, I could remember a few words of MK Gandhi when he said “The school must be an extension of home. There must be concordance between the impressions which a child a gathers at home and at school, if the best results are to be obtained”. But what we could witness here is completely opposite scenario, a complete disconnect of school’s learning with the learning of a child at home. Radhika is a 12 year old girl who studies in class V in a private school near her house. She belongs to the ‘Kumhar community’ in the area. Traditionally, Kumhars belong to the ‘potter’ community. In this area, most of the Kumhar families still engage in their traditional occupation. Radhika’s parents are illiterate and never went to school. Her father is a bus driver and her mother is a potter. They have a monthly income of around Rs. 8000. Unlike many other communities in the area, the Kumhars have lesser land holdings. Radhika’s father owns approximately 1.5 Bigha of land (around 0.3 hectare). She has 3 siblings – two sisters and a brother. It was strange to know that despite having so many financial limitations, Radhika is studying in a private school. The Panchayat has 9 government schools and in most cases only children of higher income families send their children to the private schools. We were therefore quite eager to know about the motivation of Radhika’s parents. 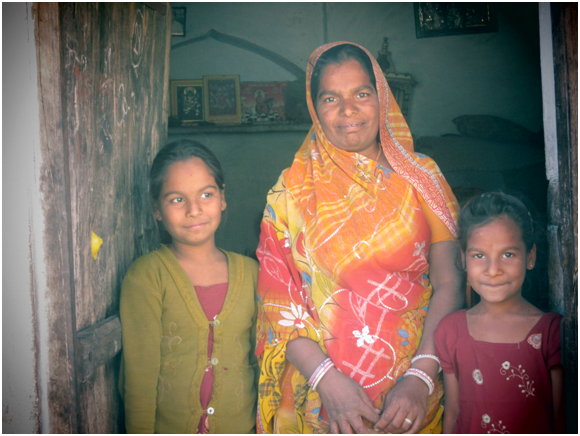 In her mother’s view, education will lead her children to a prosperous life. They won’t be able to survive by doing prajapat’s work (i.e. pottery). She says, the standard of education in the nearby government school is quite poor and the teachers are not interested in teaching. Moreover, the environment in a government school is not suitable to learn anything whatsoever. In this area, the motivation level for educating a girl child is also quite poor. Girls tend to get drawn into farming or traditional household jobs from a very early age and also get married at a young age. In the lower castes particularly, girls do not get education beyond class VIII or X. Most of the times, parents don’t even admit girls in school. It was therefore good to see a passionate mother standing up for her daughters’ education. “I will make her study to the level she wishes to study”, Radhika’s mother said, as according to her education is the tool for survival in the years to come. “I tell my story not because it is unique, but because it is not”. 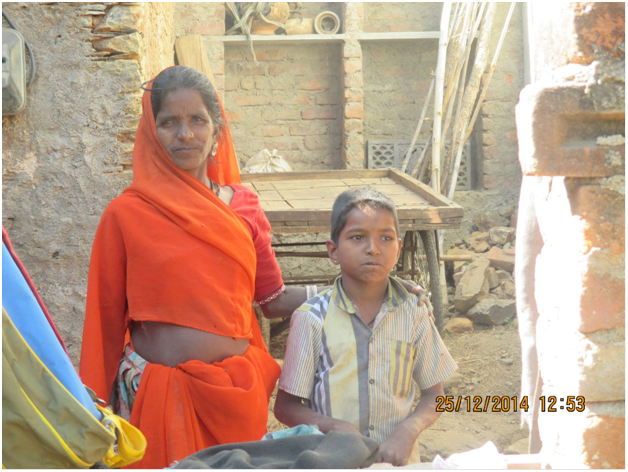 Suresh who lives in the village called Majam of Gogunda block is different from other children of his age. He has been paralyzed since birth. Suresh is unable to walk properly as he drags his feet while walking. Despite this, he still walks alone to school daily; such is the passion for learning in this child. Though he is differently – abled, he does not let his disability come in the way of his doing what he wants to do. He loves to write, even though he does so with much difficulty, as his hands have a tremor while writing. However, unlike other differently-abled children, Suresh’s story is inspiring and surprising. While interviewing the head of the upper primary school, Madam Seema we came to know about Suresh. We went to his place to know more about him. Suresh belongs to the Meghwal community whose traditional work is to skin dead animals to make footwear. Many of the Meghwals still practice the traditional occupation. Suresh is the only child in his family. His father owns a small patch of land where he does cultivation and rears goats. The tiny plot of land (around 0.3 hectare) enables him to grow food enough to feed his family from one of the two cropping seasons. Due to lack of water, his family does not grow Rabi crops. During that part of the season, his father works as a labourer in the city. His mother runs a small grocery shop and they live along with his grandmother in a kutcha house built under the Chief Minister’s housing scheme. Several people criticize the ‘No Detention Policy’ of the RTE act on several grounds. But Suresh’s case makes us ponder over the merits of the policy. Suresh is currently studying in class IV, but he is unable to read and write to pass any kind of exam whatsoever (be it written or oral). It is because of the ‘No Detention Policy’ that he has been able to study till now. “If I fail him, I am sure he will leave the school immediately. He does not want his disability to be a reason not to study. Though he cannot hold a chalk or a pen properly, yet he will continue to put all his efforts till he writes it”, said Seema. ” I wish RTE had some special provisions for disabled students like Suresh”, she added. His mother wants him to study but she is afraid that poverty and the disability of her son might stop his education. “It is the motivation of Madam Seema that makes me to send him to school”, his mother said. Fearlessly, in search of wisdom and knowledge he travels almost 12 kms daily to go to school. Ignoring the thistles, pebbles and thorny bushes laden here and there he goes to school every day. Valuram is studying in class 10. He is one of the brave ones who chose to study unlike other children of his age in the community. Yes, studying indeed is a challenge for the people living in his community, simply because school is far away from his home. The 6 kms distance is not a straight road but rather, includes climbing a hill and walking on a road full of thistles and pebbles. Valuram’s commitment to study can be seen from the fact that he scored the highest marks during class VIII and the state government has given him a laptop as a gift for the achievement. Unfortunately, he could not use the laptop because his village has no electricity. This is a fact for a number of students like Valuram, who, for this reason have sold their laptops to other people in the city for a small amount. But Valuram didn’t sell his laptop. His mother told us that though they were willing to sell the laptop the teacher of the school wouldn’t let them do so. To know the scenario of the place better, we went along with him. 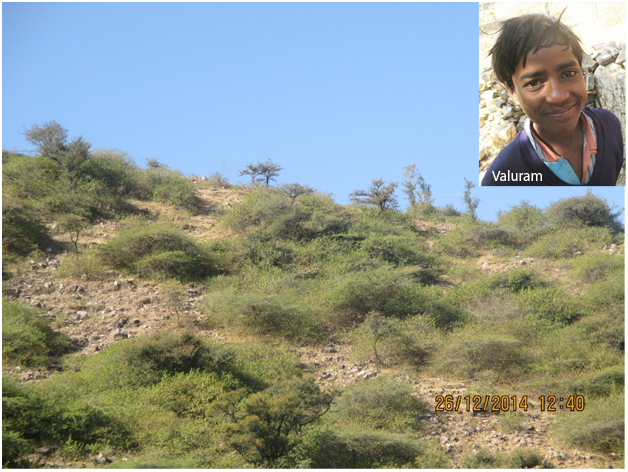 It took nearly an hour and a half to reach the place where he resides – Sanghon ka Vera, a tribal hamlet which falls under Gogunda block of Udaipur district. Sanghon ka Vera is in a valley with nearly 40 families. Till date, there is no electricity and water supply in that region. Valuram belongs to the Bhil tribe. The Bhil tribe has very low literacy rate. In fact, Valuram’s mother never went to school and his father gave up studies after finishing class V. He has 4 siblings – 2 brothers and 2 sisters. His parents are sending all of them to school. Being the eldest son of his family, he is struggling hard to achieve what none in his hamlet has ever achieved yet. His father is a tailor in the city. He travels 50Kms daily to the city to earn some money which is just sufficient to feed his family. But his parents wish to make all 5 of their children (including the girls) to study to the level that they wish to study. His mother said, “His father won’t let poverty break the momentum of his child”. Almost all the people accept the situation as it is. The major source of livelihood is either meager work in nearby village shops or subsistence agriculture. Even in agriculture, the major chunk of the population is dependent solely on kharif crops, as the rabi crops need abundance of irrigation. The secondary occupation is livestock rearing. They have animals like goats, camels, etc. which they sell only in adverse situations to get immediate monetary assistance. Further, ‘Sanghon ka vera’ is totally cut off from government initiated welfare plans and policies. Poverty sometimes acts as a monster which takes its toll and the worst sufferer and the softest target is always a child’s future. While we can’t generalize, it does appear as if this boy has something outstanding in him – the natural gift of perseverance, patience and extraordinary confidence. He talks less and listens more. His silence, however, brings to mind the truth in Binoy Acharya’s words “sometimes, we need to learn from people’s silence”. Though the path Valuram has chosen might seem humble to create even a ripple in the vast sea of the outside world, he is confidently preparing himself to fly high and break the shackles of all difficulties. Read this article by SBI #YouthforIndia fellow Varun Sharma, who wrote this after visiting Sohaba, which is an extremely interior village at Odisha. वर्तमान परिवेश में शिक्षा के इंस्ट्रुमेंटल उद्देश्य को नाकारा नहीं जा सकता, इसमें मेरे नज़रिए में कोई दो राय नहीं है. परन्तु अगर हमारी शिक्षा प्रणाली केवल इंस्ट्रुमेंटल उद्देश्य को ही पूर्ण रूपेण प्रोत्साहित करना शुरू कर दे तो यहाँ मुझे अहम् समस्या नज़र आती है. अगर हम शोषित वर्ग की बात करें, चाहे वो आदिवासी हों, दलित हों या मुसलमान हों, आर्थिक गरीबी गहराई तक पैर पसारे है, पर खासतौर पर ग्रामीण तबकों में सांस्कृतिक और चारित्रिक गरीबी अभी भी कम से कमतर है. इन्ही वर्गों में अगर सामाजिक सर्वे करें की इन वर्गों के “शिक्षित” मनुष्य जो शिक्षा के इंस्ट्रुमेंटल उद्देश्य को पा कर आर्थिक गरीबी के चक्रव्यूह से निकल सके उनका समाज में क्या हस्तक्षेप है, तो हम पायेंगे वो अपने समाज और वर्ग से उतनी ही दूरी बना चुके होते हैं जैसे कोई ब्राह्मण अछूत से दूरी बनाता था और काफी हद तक आज भी बनाता है. साथ ही अनजाने में, वर्तमान शिक्षा प्रणाली के बनाये हुए आर्थिक रूप से “सशक्त” ये बन्धु अन्यों को भी इसी रास्ते पर चलने को प्रोत्साहित कर रहे होते हैं, उस रास्ते पर जो हमारी वर्तमान शिक्षा प्रणाली ही दिखा रही है, वो तो सिर्फ वाहक हैं. इसके विपरीत कहा जा सकता है, “ये स्वयं की मर्ज़ी का भी तो सवाल है, की कौन क्या करना चाहता है.” पर अगर एक गाँव की बात करें, तो एक रहवासी तो नज़र आये जो वर्तमान शिक्षा प्रणाली से निकल कर तूफ़ान के विरुद्ध मुख कर के खड़ा हो. दाल-चावल तो आदिवासी स्वयं उगा कर खा ही रहे हैं, इतना आत्मबल उनमें है, समस्या है की हमारे-तुम्हारे जैसे सिस्टम में बैठे और सिस्टम के थोड़े-बहुत जानकार “शिक्षित” लोग वो भी उनसे छीनने में लगे हुए हैं, कभी वैश्वीकरण के नाम पर, तो कभी उनके अपने “विकास” के नाम पर. एक बहुत जीवन्त उदहारण है हरित क्रांति के बाद हमारे क्षेत्रीय बीजों का पूर्ण रूप से लोप, अभी कुछ समय पहले एक रिटायर्ड कृषि अधिकारी से बातचीत हुई थी, उन्होंने कहा की, “अब तो हम रासायनिक उर्वरक और हाइब्रिड बीज के खिलाफ अलख जगा रहे हैं, अच्छा हुआ हम इन आदिवासी क्षेत्रों में उस समय नहीं पहुंचे वरना यहाँ भी यही हाल हो गया होता जो आज पंजाब का हो रहा है.” आदिवासी वर्ग में ही जो “शिक्षित” हो गए हैं वो शोषण के खिलाफ़ लड़ने के बजाय, शोषक के साथ ही जा कर खड़े हो गये, क्योंकि वर्तमान शिक्षा प्रणाली विभिन्न माध्यमों के द्वारा चीख-चीख कर कह रही है, वो माध्यम कभी वैश्वीकरण, कभी माता-पिता, कभी शिक्षक और कभी पुस्तकें ही- की भैया सबसे बड़ा रुपैया- शिक्षा का इंस्ट्रुमेंटल उद्देष्य अकेला रह कर उपरोक्त रूप ले चुका है और शोषक वर्ग के पास पैसा बहुतायत में है ही, चाहे वो टाटा, बिड़ला, अम्बानी कोई भी हो और हमारी “लोकतान्त्रिक” आज्ञाकारी सरकारें. उफ्फ्फ! सामाजिक ढाँचे में परिवर्तन लाकर समस्या का जो हल ढूँढने का प्रयास किया जा रहा है, मेरे नज़रिये से वो हल कभी मिलेगा ही नहीं, जैसे कुत्ता भूख लगने पर खुद की ही पूँछ को खाने को दौड़ रहा हो, पर गोल गोल घूमता रह गया बस. मेरा कहने का तात्पर्य है की अकेले ऐसा करने पर समस्या की जड़ हम गलत जगह ढूंढ रहे होंगे, हालांकि ये जगह जड़ के काफी करीब है और मत्वपूर्ण भी. मैं शिक्षा-प्रणाली को, कम से कम इस दौर में, जब मानकीकृत शिक्षा प्रणाली की पहुँच बहुत बढ़ गयी है और सब तरफ साक्षरता के नारे लग रहे हैं, सामाजिक परिवर्तन लाने के बहुत तेज़-तर्रार माध्यम के रूप में देखता हूँ, और यही तो इसके माध्यम से अभी किया भी जा रहा है- हमें हमारे अधिकारों के लिए लड़ने की सोच से दूर करके, भरण-पोषण तक सीमित करके. इस मानसिकता में ही खोट है की पहले आर्थिक रूप से मजबूत बनो फिर अधिकारों की सोचो, आर्थिक प्रणाली में रहने पर जब तक आपके मूल अधिकार सुरक्षित नहीं है, तो ये वक्तव्य हमें पिंजरे में बन्द गोल-गोल घूमने वाले तोते सा बनाने का प्रयास नज़र आता है. उदहारण चाहिये, तो काशीपुर-उड़ीसा में आदिवासियों के विरोध की सच्चाई उठा कर पढो, मेरा मतलब और सहज तरीके से समझ पाओगे. परिवर्तन की लहर दोनों ओर चाहिये-शिक्षा प्रणाली और सामाजिक ढांचे में. अकेले सामाजिक ढाँचे में, या अकेले शिक्षा प्रणाली में परिवर्तन के प्रयास निरर्थक होंगे, क्योंकि समानान्तर हमारे विद्यालयों में या हमारे सामाजिक ढांचों में जड़ मनुष्य तैयार होते रहेंगे. रही भाषा की बात, तो संस्कृति और भाषा को बांधा नहीं जा सकता पर विज्ञान के दौर में जब ये एकदम स्पष्ट है की बच्चा मातृभाषा में जल्दी और अच्छे से सीखता और सोचता है, को आगे बढ़ने ही नहीं दिया जा रहा है. हर भाषा को आर्थिक कारणों से जोड़ना सम्भव नहीं है पर, हर भाषा को मानकीकृत या गैर-मानकीकृत रूप से कक्षा में जगह देना पूर्णरूपेण सम्भव है, बस प्रयास राजनीतिक और बहुसंख्यक वर्ग के कारण जो की शिक्षा का सिर्फ इंस्ट्रुमेंटल रूप ही चाहते हैं, जो की उनके पक्ष में भी है, के कारण आगे नहीं बढ़ पा रहा है. जैसे हम आज छात्र-केन्द्रित शिक्षण पर ध्यान दे रहे हैं वैसे ही शिक्षा-प्रणाली को- अधिकार केन्द्रित, तर्क केन्द्रित, क्षेत्र केन्द्रित और इंस्ट्रुमेंटल उद्देश्य केन्द्रित बनाने के प्रयास किये जाने चाहिये. ये मैं कोई नई बात नहीं कह रहा हूँ, NCF-2005 चीख-चीख कर यही बातें कह रहा है, पर हम संस्कृत को “तीसरी भाषा” और गीता को “राष्ट्रिय कृति” बनाने के प्रयसों में उलझे हुए हैं. इन सबसे ऊपर उठना होगा, वर्ना तैयार रहो अन्धे समाज में अल्प दृष्टि वाले बनने के लिए. Sonali, SBI #YouthforIndia fellow, shows how language and culture need not be a barrier when it comes to talking with children at Kaprada, Gujarat. After lunch, all of us at the school were feeling drowsy, and the students were to attend the next class, with Sailesh sir. Luckily, it got rescheduled with me and I got the opportunity for my first set of ‘Ice Breaking’ activities. I had purposely scheduled it for the last session of the day because I was a little worried as the children were from grade one and two and hardly spoke Gujarati and Marathi. Everyone here speaks their native tribal language. My fears increased because I was already struggling with my poor Hindi speaking skills and to top it off with worse Gujarati and Marathi language skills. Fortunately, this apprehension didn’t last for more than a minute after we met. Soon afterwards, we all held each other’s hands, sang and laughed together and with this broke all the differences that remained amongst us. Most importantly, we all learnt that no barrier exists in understanding each other’s cultures and the best way to do it is, of course through, music, dance or a play! 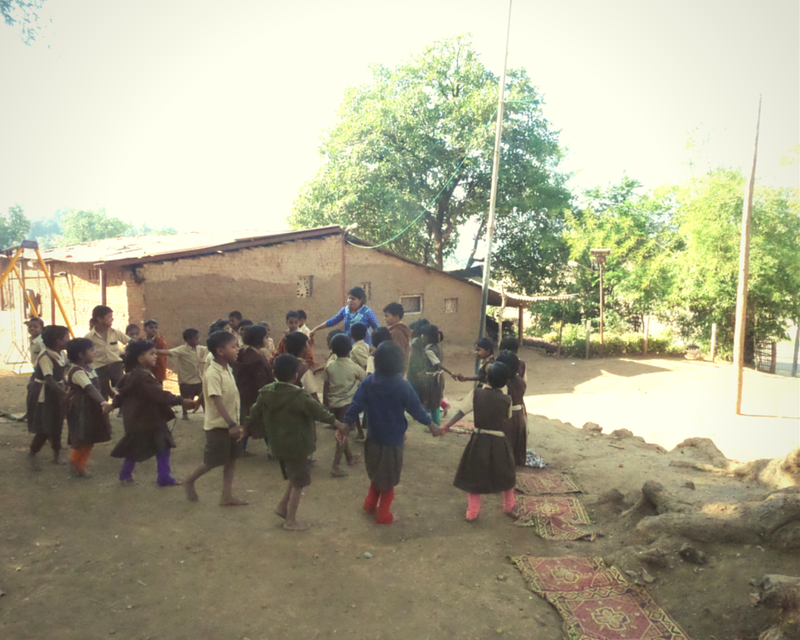 Below is a small video, shot by me, where the children are singing a traditional song. Negligent healthcare for rural Indian children? A short note on Komal Ramdey’s experience of being a part of health care camp at Goondiya, Gujarat. Of all the forms of injustice, inequality in healthcare is the most shocking and inhumane. These words of Martin Luther King kept echoing through my mind along with the phrase that all of us are taught at school, that India does not live in its towns, but in its villages. What we weren’t taught however, was that much of India does not live happily and healthily. Goondiya is a village in Walia Taluka of Bharuch district in Gujarat. It is 70 kilometres away from the city of Ankleshwar. A closer look at the stunningly beautiful images of Jowar(Sorghum) fields rippling in the wind and children playing games in the village campus, will reveal that a quarter of those people working in the fields are chronically starved and half of those children playing are permanently stunted through malnutrition. 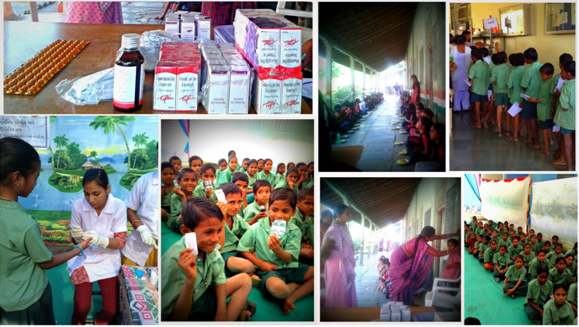 The Primary Health Centre (PHC) at Goondiya organised a health care camp and I was fortunate to volunteer in it. This health camp was aimed at promoting health awareness among school children regarding common ailments, nutrition, hygiene and sanitation. Around 400 school children participated in this. Firstly, an ASHA (Accredited social health activist) worker started the check up process by taking height and weight measurements of these children. Later the PHC nurse carried out the general check up and provided medicines to those suffering from fever, cold and sickle cell deficiency. She also told the children about oral hygiene. After the complete diagnosis, it was found that most of the school-going children were suffering from malnutrition and common problem of stomach ache. Also, children here suffer constantly from cough and cold allergies. Improper food habits, prevalent amongst most of them, have led to the deficiency of iron. The burden of disease and its effects were disproportionately seen in the school-going kids, with a clear gradient in illness. This camp taught me that there is a massive level of lack of nutrition and a vast unmet need for curative health care among the school-going children. Further, the neglect of their health has aggravated the miseries of rural people!